Business Loan - Apply online for business Loan and get instant loan. LoanAdda provides you with various benefits like you can easily check your business loan eligibility through our EMI calculator. Apply with LoanAdda for business loans, and avail the best and lowest interest rates. 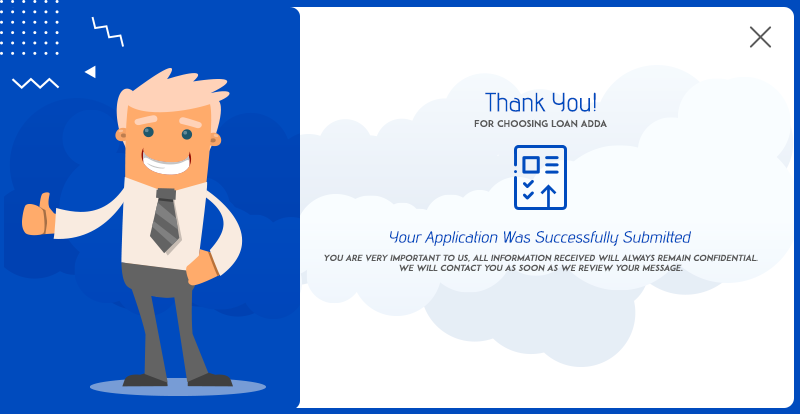 By opting for quick paperless online loans from LoanAdda you can get an instant approval within 5 mins and disbursal of loan amount in 24 hours. LoanAdda helps you choose from business loan offers across top Banks and NBFCs at your fingertips. Want to setup something new in business? Or want to change its interior? Or want to invest for something? No worries, we have an option of Business loan for you. An unsecured business loan is without any collateral or security that can be availed by SME’s to raise debt for short term financing purposes. These are provided by various banks and NBFCs. Taking up business loan is a great step towards extending or taking forward your business. They are usually ideal for meeting your short term financial needs like unexpected expenses, dream holiday, home improvement expenses etc. Fill in the Business Loan Application Form, to check your eligibility. Compare various business loan options, and apply for the suitable option.